Linda is so ready for King's Day. Let's talk about Kingsday. This Dutch national day of celebration is Western Europe's best kept secret. I have been putting off this post because it feels actually impossible to try to capture the absolute, utter bliss that was my Kingsday experience. But here goes nothing. To kick off the weekend, Linda and Jackie arrived in Amsterdam on Thursday evening. We grabbed a yummy vegetarian dinner down the street and then hastily got ready for our night. My grand idea was to take them out to Pacific Park, which I'd heard amazing things about, but had never been to myself. I dragged my entire group of friends out there, only to arrive at a sweet, but entirely empty, venue. I guess Thursdays aren't there big night. But not to worry... We hopped in a cab down to Leidseplein and headed to Paradiso, my now favorite Thursday night club. We danced the night away with twenty-some of the USC kids in town for Kingsday, all under the roof of a retired church (stained glass windows included). It was epic, and Linda has Go-Pro footage to prove it. Post-'diso, the girls and I meandered around Leidseplein. We quickly made friends with a group of Dutch guys, whom Jackie and Linda were smitten with, still unaccustomed to the level of face in the Netherlands. All we really came away knowing about them was that they worked at a French-Fusion restaurant in the Nine Streets, and one of them was on a vehement quest to find a "haadog" (read: hot dog). Needless to say, we scoped the Nine Streets hard for said restaurant, but to no avail. "Haadog" takes on new meaning in all of our lives. On Friday, we woke up late, rented bikes, and set out. Breakfast was Pancakes Upstairs, a famous, hole in the wall place I had been dying to try. We were all impressed. 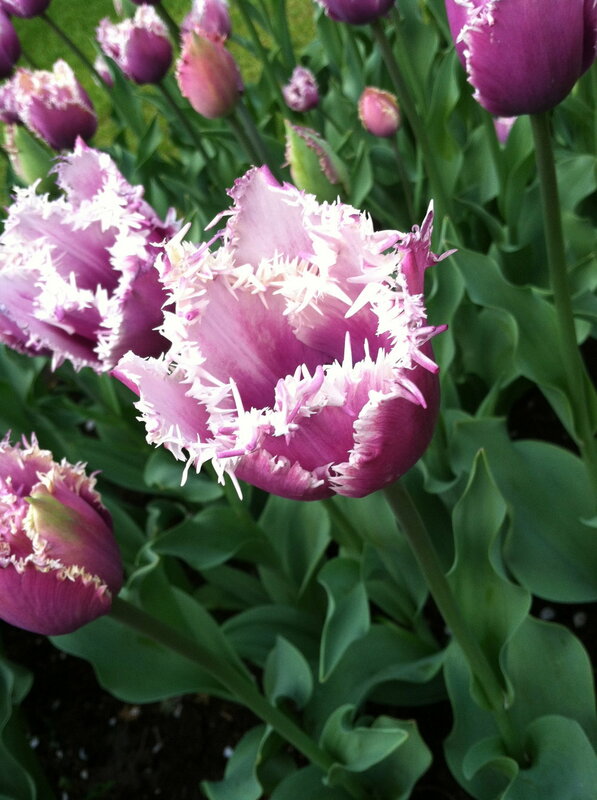 From there, it was decided that we must and would go to the Keukenhof, the famous tulip fields, that day. The journey to get there was long and arduous, but finally, at an hour and a half until closing, we arrived at the fields. The gardens were awe-inspiring, jaw-dropping, enchanting, magical, beautiful, lovely...there aren't enough positive superlatives to accurately describe their majesty. With the park mainly bereft of other visitors this close to closing, we wandered with an even more acute understanding of the beauty surrounding us. Teapot ceiling at Pancakes Upstairs! 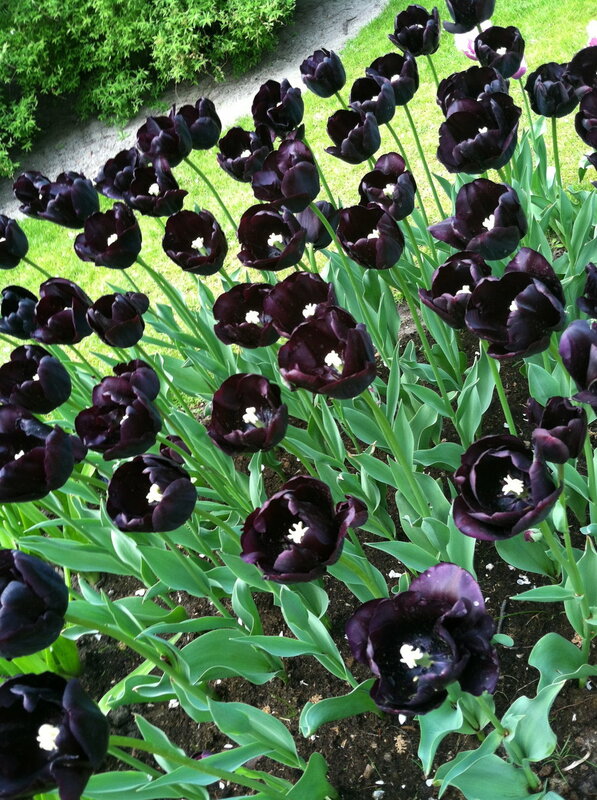 Black tulips. Like, soy moody. On our wait for the bus ride home, we met a Dutch guy named Michael. He looked 40, acted 17, but actually turned out to be our age, 20. He thought we were the funniest girls he'd ever met, because we coined the term "super lekker" and its later adaption, "hella lekker." Like he was in stitches. He also taught me how to count to 15 in Dutch, and for that, Michael, we love you. Awh, Jacqueline amidst pretty flowers. 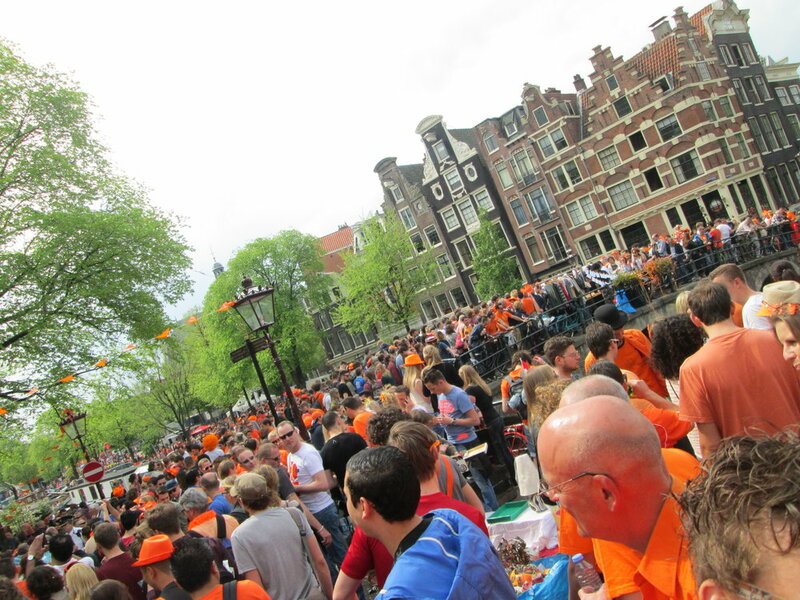 Upon our return to the city, the pre-Kingsday energy was in the air. Street lamps dressed in orange, stages and booths going up left and right, people milling the streets, beers in hand, laughing, singing along to the goofy Dutch songs blaring over PA speakers. We were giddy with excitement. King's Night had begun. After a big pre-game in my tiny dorm, our huge USC group hit the streets just outside my door. I oh-so-conveniently live on the Prinsengracht, which is the city's fourth inner canal ring and thus about as central of a location as you can get. We danced at various stages and made new friends on our precession down to Leidseplein and basically were just the happiest kids in the streets. We called it an early night, as we all wanted to conserve for the big day following. King's Night pregame in ya girl's room. GOEDEMORGEN KONINGSDAG! The drinks began flowing at 11 a.m. at a now actually massive pregame in my room. We must have packed +30 USC kids into a room meant for one, reliving our New North days at 'SC. Eventually, we moved it down to a bigger room, home of Dan and Ari. At this point, the pregame was composed of all of the people I love from USC and all of the people I love from CIEE. Perhaps the happiest day of my life. Loved hosting the USC homies in my city. The sun was shining, the streets were bursting at the canals with orange-decked Dutch friends, and so many of the people in the world that make me happy were in one room. This is my bliss. Eventually, the pre-game turned into game time, and we hit the streets to partake in the festivities. Not long after, Jax, Linda and I had to grab our bikes and head out to our Open Air Bakermat Festival. With streets so packed we had to walk our bikes for ten straight minutes, you can understand how it was easy for me to fall and sprain my wrist while biking the 20 minutes out to the festival. Minor casualty to an otherwise perfect day. 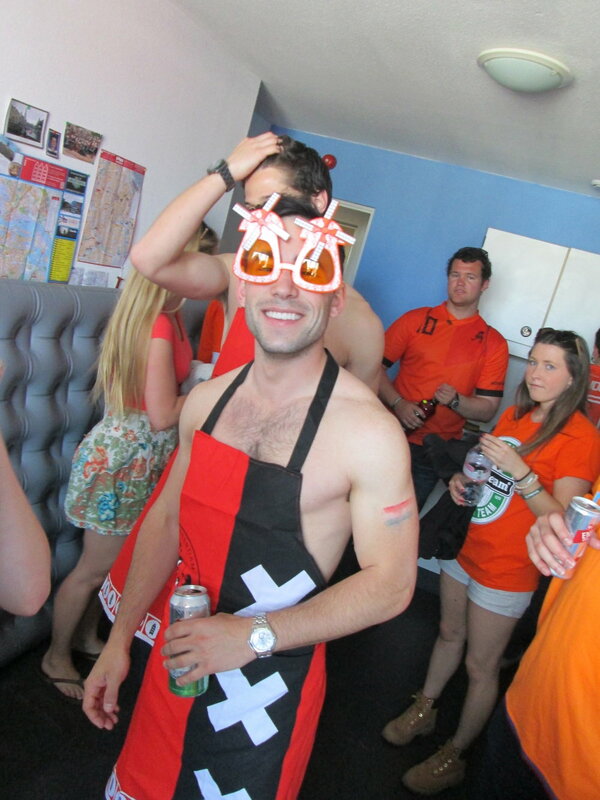 King's Day boat parties = crucial. The streets on King's Day! Ps. Orange is the royal color. Another street shot! Legit packed. The concert was magic. A little piece of Coachella sent to Amsterdam by the music gods. We danced and danced and then collapsed on the grass in an exhausted, blissed out heap. The last of our energy we used to bike home, and from there, it was lights out. King's Day will have you on your back at 10:30 p.m., my friends. That about sums up the most incredible weekend of my abroad experience thus far. I want to come back to Amsterdam for King's Day every year. Heck, who am I kidding, I want to live in Amsterdam for the rest of my life.